A ball gown is the most formal female attire for social occasions (such as white tie). It is traditionally a full-skirted gown reaching the floor, made of luxurious fabric, delicately and exotically trimmed. Most versions are cut off the shoulder with decollete necklines. Such gowns are typically worn with a stole (a formal shawl in expensive fabric), cape or cloak in lieu of a coat, "good" (couture or vintage) jewellery and opera-length gloves. Standard accessories are dancing shoes and a clutch style evening bag. Where "state decorations" are to be worn, they are on a bow pinned to the chest, and married women wear a tiara if they have one. The ball gown shape has changed little since the mid-19th century. Although artificial fabrics are now sometimes used, the most common fabrics are satin, silk, taffeta and velvet with trimmings of lace, pearls, sequins, embroidery, ruffles and ruching. Evening gowns were the formal attire of women during the Regency era. They had the Empire silhouette, with a high waistline, short sleeves, and a fairly narrow skirt. In the Victorian era however, skirts began to widen. Evening gowns now had skirts flared out with layers of petticoats. The increasing weight of the petticoats led to the development of the crinoline. 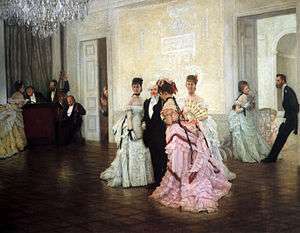 The crinoline would be worn under day dresses and evening gowns alike in the 1850s and 1860s, but evening gowns were replaced by the "ball gown" for most formal affairs. However, starting in the 1870s, dresses began to take on a narrow silhouette, and more attention was focused on the back of the skirt. The bustle became popular during this time. At the end of the 19th century, bustles disappeared and skirts took on a simple bell-like appearance. In the Edwardian era, women's day dresses and evening gowns had an S-curve silhouette. During the 1920s, the hems rose and decorations became more showy. This would lead to more conservative dresses during the Great Depression. 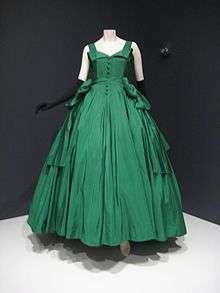 After the end of World War II, in 1947, Christian Dior introduced his "New Look" of nipped-in waistlines and full skirts. Luxurious fabrics were used for these dresses, and the ball gown was re-introduced. The ball gown often has a strapless bodice, although short and long sleeves are common as long as the cut is off-the-shoulder. Ball gowns remain the most formal female attire to this day, and are worn exclusively to balls. jewellery - earrings and necklace; rings and bracelets are optional. A watch is not considered appropriate except for jeweled versions in which the face is covered so that it resembles a bracelet. tiaras - If married and the event does not take place in a hotel. For their debuts, debutantes wear long white dresses that were once similar to ball gowns. They also wear long white leather gloves that go well above the elbow and that close with small pearl buttons at the wrist, even though nowadays it is very common for girls to wear long satin gloves. Their jewellery is understated and suitable for a young lady about to be formally presented to society for the first time. ↑ Caroline Davies (2002-03-17). "Single girls shouldn't let diamonds go to their head". The Daily Telegraph. London. Retrieved 2009-04-13. Wikimedia Commons has media related to Ball gowns.